Amazing location in the Alphabet/Nob Hill District. 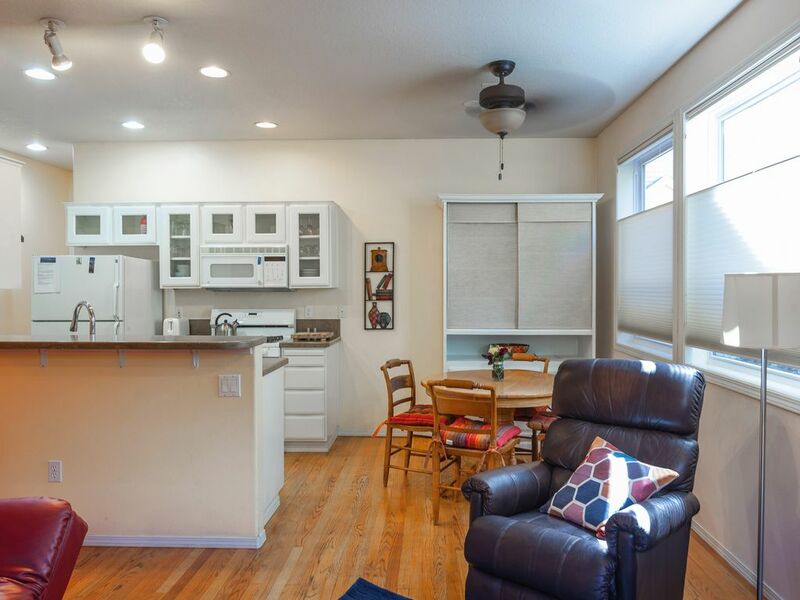 Located in the hub of activity and access to all areas in Portland. Fine and Casual Restaurants/Dining steps away from the condo. Independent Movie Theatres, Galleries, Music, Craft Breweries, Shopping, Timbers Soccer Stadium 5 minute walk, Blazer's Stadium 10 minutes by Max line. Portland Zoo 15 min by Streetcar/Max. Portland Airport easy access by streetcar/Max. Please see FREE APPS for your smartphone or mobile device to guide you using public transportation. The Portland MaxStreetcar is just steps away. Attached garage. The townhome is in a 10 unit complex and is quiet and fully stocked with all the needs of a home away from home. Wifi 50Mbps/Cable TV. Private attached single garage to safely leave your car during your visit to this lovely Portland condo. Please note: Cars larger than a Honda Pilot will not fit. Street parking is available if your car is too large. Excellent Location in NW Portland. Close to everything and easy access to public transportation. Private attached single car garage to park your car. Half Bath Downstairs off Kitchen. Half bath downstairs. Full bath with full size Tub/Shower upstairs. Hairdryer, curling iron provided. There is a window A/C that we place end of May to mid September. Garage parking with direct entry into condo. 50 Mbps wifi. Stream all the shows you like. Two person patio set available in private gated patio. Heart of NW Portland. Steps away from Portland Streetcar. Pearl district 5 blocks walking. NW 21st/23rd Street one block away. Many fine restaurants/shops/craft breweries. Our Townhouse is less than 5 blocks from the Pearl District and 1 block from NW 21st and 23rd Streets. There is also a private parking garage directly attached to the condo. You can walk or take Portland's excellent public transportation during your visit to Portland. Cancellation 31 days or more full refund. Cancellation within 30 days of reserved dates- NO REFUND UNLESS CONDO IS RE-RENTED.